Although both my kids are good at maths, neither of them do well under time pressure. I can relate – they get their relatively slow processing speeds from me. We enjoy mulling over puzzles, not quick-fire quizzes. 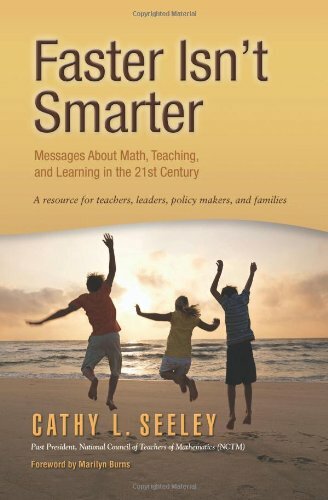 So I was immediately drawn to Faster Isn’t Smarter: Messages about Math, Teaching and Learning in the 21st Century, a collection of essays about teaching maths, when I saw it recommended by one of my favourite maths authors. Faster Isn’t Smarter is set out as 41 independent messages that can be read in any order. I personally read the whole book from start to finish on a Turkish beach (back in October, not last week – shame). I came home inspired and enthusiastic to continue our living maths adventures. The book’s eponymous essay, Faster Isn’t Smarter: The Trap of Timed Tests, talks about how some of the world’s greatest thinkers, scientists and mathematicians weren’t fast at arithmetic, but went on to be very successful at higher-level maths. 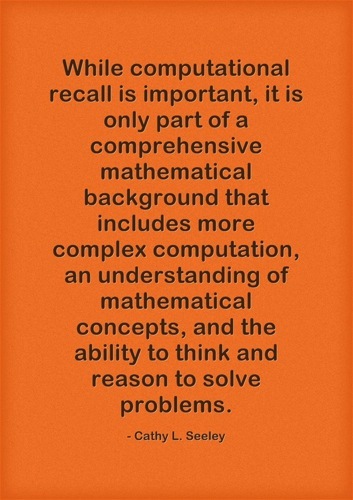 This message paves the way for a discussion about what skills are important for mathematical thinking. In Seven Steps Toward Being a Better Math Teacher, the author suggests that most maths curricula try to cover too many topics in one year, leading to superficial coverage and little depth. To counteract this, she advises maths teachers to identify priority topics for each grade level. As homeschoolers we’re free to choose what our children learn, when, and how. Faster Isn’t Smarter‘s “depth over breadth” discussion has encouraged me to do what feels right for our family, despite the extensive list of topics presented in schools each year. This doesn’t mean we have to stay on one topic for months. It just means we don’t have to rush from one topic to the next in order to get through vast amounts of material at a pace dictated by someone who doesn’t know how the individuals in our family learn best. For example, C(10) and I spent several months exploring fractions. During our journey we played with multiples and factors, prime numbers, multiplication table tricks and probability – all led by C(10)’s interest. She’s now using Math Mammoth worksheets to consolidate her knowledge of multiplication facts and division procedures. Most curricula would do this the other way around, teaching the facts before their fancier applications. But because we are not trying to check off a long list of other topics this year, we were able to work in the way that best suited C(10). The chapter Creativity: An overlooked element in school mathematics observes that it’s not enough to teach mathematical facts and processes. Children need something more to equip them with the creativity and innovation skills they will need in the 21st century workplace. before we have a student who knows how to think creatively. As homeschoolers we have the luxury of being able to spend at least as much time developing our children’s problem-solving strategies and stimulating their interest in maths as we do providing access to knowledge. When we’re not trying to get through a hefty curriculum or long list of topics each year, we have time to play with the kind of mathematically relevant puzzles and games used by the best maths teachers throughout history. These are exactly the kind of activities that, in our family, were too often pushed aside as “extras” back in the days when we used a maths curriculum. use maths (solve a wide range of problems and apply the maths they’ve learned). The author concludes by encouraging readers to combine the ideas from Faster Isn’t Smarter with other ideas in our communities. She calls for visionary, ambitious thinking and positive, connected actions to take on some of the greatest challenges in mathematics and in education in general.As homeschoolers we’re not weighed down by the bureaucracy that hinders schoolteachers from responding effectively to these challenges. I’d recommend this very readable book to any parent in search of some fresh maths inspiration – whether you are homeschooling or supporting your child outside school. * This post contains Amazon affiliate links. I bought my own copy of Faster Isn’t Smarter and wasn’t paid for this review. I still wish you’d get a wordpress Like button, Lucinda! I’ve been reading quite a few of your maths posts over the last week or so whilst reassessing how I approach things with T. Your writing, ideas and links have been very useful. Thank you! When I saw your comment I thought, “huh? I’m sure I set one up after Lucy first suggested it…”. Then spent the last hour trying to sort it out (which is presumably what happened last time I tried). It’s even managed to defeat my tecky husband!! I shall keep trying though, I know what you mean, I like that easy little button too. But anyway, thank you taking the time to say hi, it’s very nice to know someone’s reading. You’ve done better than me, I often seem to look at your gorgeous photos when I’m on the cross-trainer, and I never remember to come back and comment when I’m back at my computer! Lisa- you leave the most uplifting comments – thank you! I can send myself crazy if I get to thinking about breadth when it comes to any subject – so much great stuff to learn, so little time! 😀 But when I see one of my children deeply immersed in something, then I know they’re learning skills and kindling a passion that they can shine on any subject they want to know about, whenever they choose. You bring up so many excellent points. Not following a curriculum I wonder how much time to spend on each topic. My seven year old can add, subtract, multiply and divide. She learned all these skills through games and activities. We are now working on expanding these skills by doing problems with additional digits. We usually do variations on the same activity every day for a week and then try something new. Sometimes I think I’m jumping around too much, but I can see her progressing. She understands the concepts and is motivated most of the time. Do you have any recommendation for how long to concentrate on one skill or aspect of math? I know what you mean, Julie. The book doesn’t give any specific guidance on the point. Personally, I pursue a topic for as long as my daughter is engaged and learning. If I think it’s important that we stay on a topic for an extended period, I give the option of doing other things in between. For example, at the moment C(10) is working through Math Mammoth’s Division 2. I’ve made it clear that if on any day it starts to feel like a chore to her, we’ll doing something else instead (eg play a game, read a maths story or do a puzzle) and then come back to Division 2 when she’s feeling fresh again. Maths with my son, meanwhile, is work-in-progress … when I find what works with him I’ll be singing from the rooftops! Of course I now want to read this book! As you know, I am always thinking about maths. Creativity? I had a light bulb moment about a year or so ago when I realised maths can be a creative subject very much like writing. The book sounds very interesting. Thank you for your review! Sue, I love that you are always thinking about maths – I get some of our best maths resources from you! Even though I did maths A level, I feel like I am still at the start of my maths education. The older I get and the more maths I understand, the more I realise how much more there is to discover! I feel very lucky to be able to re-learn maths alongside my children. Oh yes, yes and yes!!! It was an interesting exercise to watch my two do a maths exam – my girl…BAM! Got it in one. My boy…hang on, let me think, wait a minute…ok, got it. His processing speed is MUCH slower than hers, yet they both pretty much got the same answers. I use very different resources for them because then they are less likely to compare themselves to each other (a class size of two makes for a very small population). I think I might have to buy that book now! Yes, it’s all relative, isn’t it? Luckily if you’re pretty bright, you can still work plenty fast enough to get the right answers even in a timed exam. I wish I’d read this book when I was 16 and sat next to a really fast girl in maths class. Up until then I’d considered myself really good at maths. Then, because I didn’t get the answers as quickly as Jilly-Whizz, I decided I must be a bit of a fraud. Very good idea to use different resources for your two! The book came at the right time for me, but a lot of it is aimed at policy-makers and classroom teachers. It’s not as civilian-friendly as Jo Boaler’s books, say. Thank you so much for your blog. I wish we lived closer as we seem to share many of the same strategies I would have you over for coffee 🙂 I started a living math approach this year and it has been going great! I have to tell myself to relax often when I hear about “other” kids progress because I know that what we are doing is teaching so much more then memorization. Thanks for sharing and inspiring! Hello again Alison! Thank you for your lovely comment. Wouldn’t it be lovely to get together for a lovely unschooling/living maths chat? 🙂 You will have to drop in if you are ever in England! I am so pleased your living maths has been going well. I know exactly what you mean about ignoring what “other” kids are doing. One thing that helps me is that when I look back on my own posts, I think, “Wow, did we really do all that?”. It’s funny how quickly our memories can discount all the good things we’ve done when we hear what someone else has done! Thanks for sharing about your homeschooling adventures! Does this book talk about what skills are appropriate to teach when? Hi Angie, thank you for letting me know that you’re reading! The essay, “Not your grandpa’s algebra: Preparing all students for college and the workforce” contains a discussion of the best time to teach the skills covered in Algebra 1, Geometry and Algebra 2. I came away with general insights and inspiration rather than specific tips. If you come across a book that does help with that, let me know! 🙂 Have you read Denise Gaskins’ Let’s Play Math? Thanks for suggesting Let’s Play Math. I could only find it in the Kindle version. Do you know if it comes in a hard copy, aka BOOK :o) ? I am a underliner and note maker kinds of reader! This is our second year home schooling and math is the subject I feel least creative and relaxed about. I’ve relaxed about the depth vs breadth … covering less topics but going deeper than usual for that grade if my son (almost 8) or daughter (6) show interest. Before my son was born, I was a Kindergarten and First grade teacher. Last year I found myself doing “school at home” and it wasn’t fun. After really praying this summer, God gave me some ideas and the grace to let go of my “structured” teacher self … and we are having an amazing year learning and living … and LOVING it!! If you have time to check out our blog, you’ll see the fun we’ve had learning about wool and more like our mission trip to Peru. There is so much to love and learn beyond what the government thinks our children should be taught … here in the US, I’m accountable to my local school district with what I teach and have to be evaluated at the end of the year starting next year in 3rd grade. Thanks for taking time to interact. I’ve been dipping into your blog since you first stopped by. It’s wonderfully uplifting! I’ve followed a similar more-to-less-structured path with my children. I wonder if most people do, even those of us who aren’t former teachers? Perhaps because that’s the model of education we went through ourselves? I am very appreciative I don’t have to get creative with district evaluations, I must admit. I enjoy reading on unschooling blogs how people present what their children do in a way that ticks off the boxes. It’s a good reminder of how much our children learn! It’s great creating our own education policies, isn’t it? This is really interesting. I go back and forth between being okay with the slower math and English pace that I have used with Firecracker and Rose and feeling guilty because they don’t seem to learn as quickly as their peers. I’m so sorry Rebecca – I somehow missed your comment. I know what you mean. We always put it on ourselves, don’t we? Whereas actually what we are dealing with is the unique combination of our individual children’s learning styles and our teaching/mentoring style! I love this post! Faster isn’t Smarter is about as poignant as things can get for us right now. Thanks as always Lucinda for sharing such wonderful stuff!! “Faster isn’t smarter” is a great book title, isn’t it, Loraine? I definitely need reminding of it sometimes. Thank you for your lovely comment, as always!